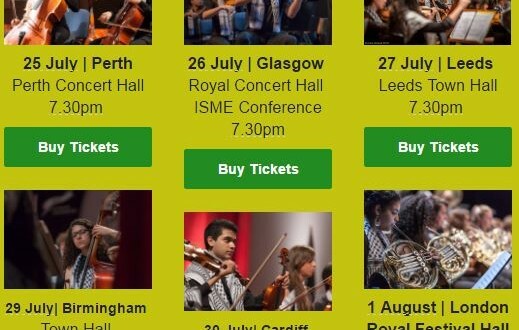 Palestine Youth Orchestra Embarks Upon First UK Tour! The UK welcomes the Palestine Youth Orchestra (PYO) for the first time, this summer. Under the baton of Sian Edwards, the young orchestra will perform at leading venues across the country, as part of their first UK tour, culminating at London’s Royal Festival Hall, to bring their message of inspiration and humanity, in spite of international political turmoil. According to the PNN, the 85 musicians, comprising students and high-level amateurs aged 14 to 26 from all over Palestine and the Palestinian diaspora, will travel to the UK in mid-July from over ten countries to embark on a six-city tour, showcasing their incredible drive, passion for music, and resilience in the face of adversity. This highly anticipated series of concerts follows on from last year’s tour of France, performances in Germany, Italy, Jordan, Greece, Oman, Syria, Bahrain, and Lebanon, and a critically acclaimed performance by a smaller ensemble of the PYO (the Palestine Strings) with Nigel Kennedy at the BBC Proms, in 2013. Established by the Edward Said National Conservatory of Music in 2004, the PYO was launched with the vision of bringing together young Palestinian musicians from around the world in a high-quality orchestral ensemble, and delivering their message of inspiration and humanity to audiences worldwide. Unable to rehearse together at home, the PYO will meet and rehearse at the Royal Conservatoire of Scotland between 18 July and 24 July. This year, they are joined by the Palestinian vocalist, flute player, and composer Nai Barghouti – a rising star of Arabic music, after her recent acclaimed performances at the Montreux Festival and the UN Headquarters in New York – and by several students from leading British conservatoires. Equally at home with Western and Arabic repertoire, the PYO maintains a unique position amongst youth orchestras internationally. On their first UK tour, they will perform music by Beethoven, the pop-inspired Metal by British composer Graham Fitkin, songs made famous by legendary Arab singers Fayrouz and Om Kolthoum, and Mussorgsky’s Pictures at an Exhibition.